At this time of year, it can be much nicer to snuggle down at home than venture out. However, you don’t have to compromise on the style of cuisine. If you want to enjoy a special meal in the comfort of your own surroundings, Pasta Evangelists are taking pre-orders now for delivery during 11th and 17th of February on a number of delicious dishes. 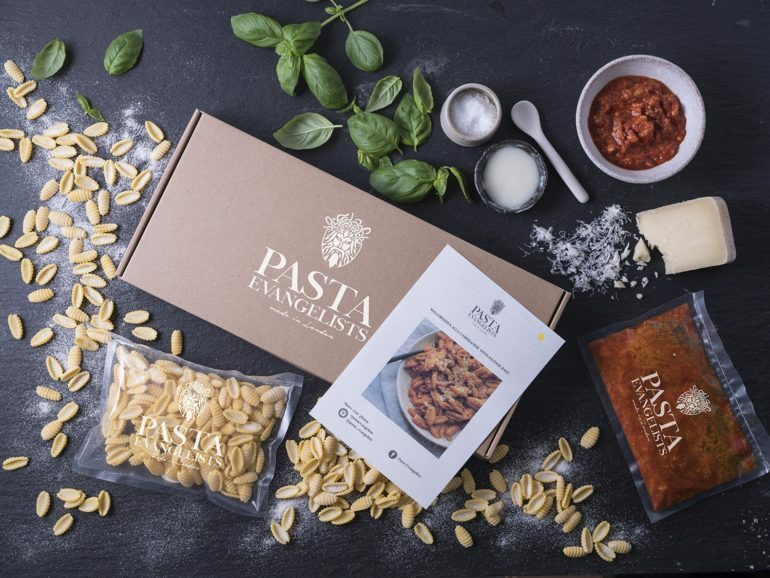 Pasta Evangelists is a company that serves up artisan pasta along with the finest sauces and garnishes from Italy to enable you to create five star dining in five minutes. Some of the meals contain meat from the Ginger Pig and there are some vegetarian choices available too. For Valentine’s Day there are some special dinners that you can order. These include Red Heart Ravioli with Tomato, Mozzarella & Basil with Sage Butter & Parmesan. There is also the classic romantic dish, Spaghetti with Beef Meatballs, which has been aptly named, Lady & The Tramp. If you want some inspiration for a celebratory tipple, take a look at our Raise A Glass series.